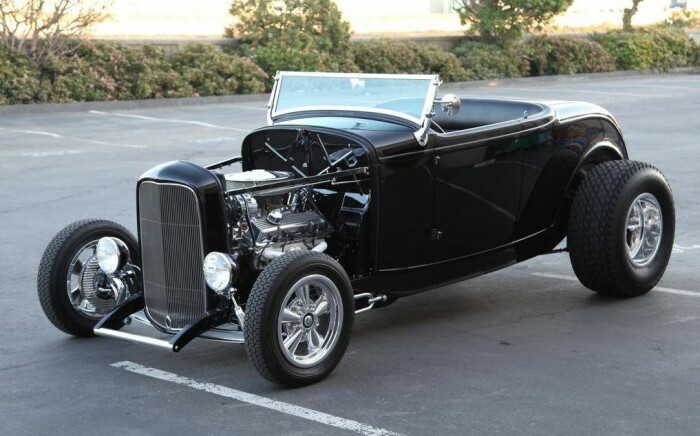 There are so many 1932 Fords that have been cut, chopped, and tinkered with that it’s almost impossible to set yourself apart with so many choices. 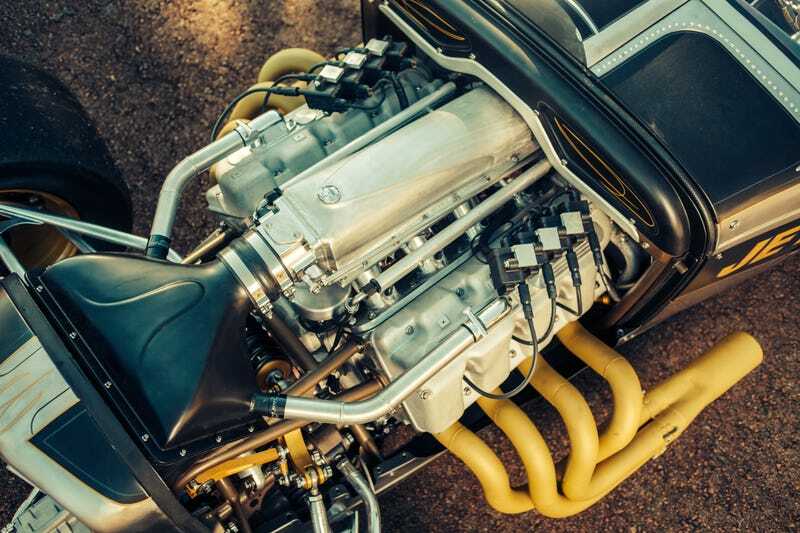 But that seemed to be a challenge for Bryan Fuller and Nick Grafias as they designed what would end up being called “Double Down.” See, most people would think the 576 cubic inch motor pushing out close to 850hp would be the star attraction on this beautiful car. But interestingly, its a little bit further down the list. See the star of the show is what immediately pops out at you when you look at the car from almost any angle, the massive 28.5×14.50-16 slick tires that happen to be on all four corners! 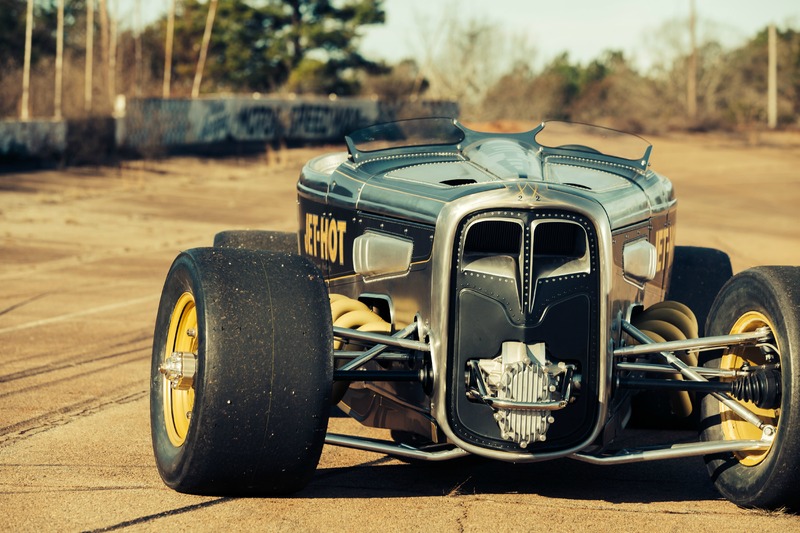 Normally the cool thing to do was have the big wide slicks in the back and small skinny tires in the front, this is the format you will see 98% of the old hotrods driving around. This wasn’t done strictly to be pleasing to the eye though, it was actually done because the car is equipped with an all wheel drive system which is obviously not a stock option for these cars. This AWD system was a major accomplishment by Fuller Moto’s Atlanta-based team, as it had never really been done before. They needed to completely fabricate a custom billet transfer case in order to provide power to the front wheels. The amount of man hours that went into this car with the engineering, fabrication and final product that i’m sure there isn’t even a count, but its easily into the thousands of hours. This car is something so special. 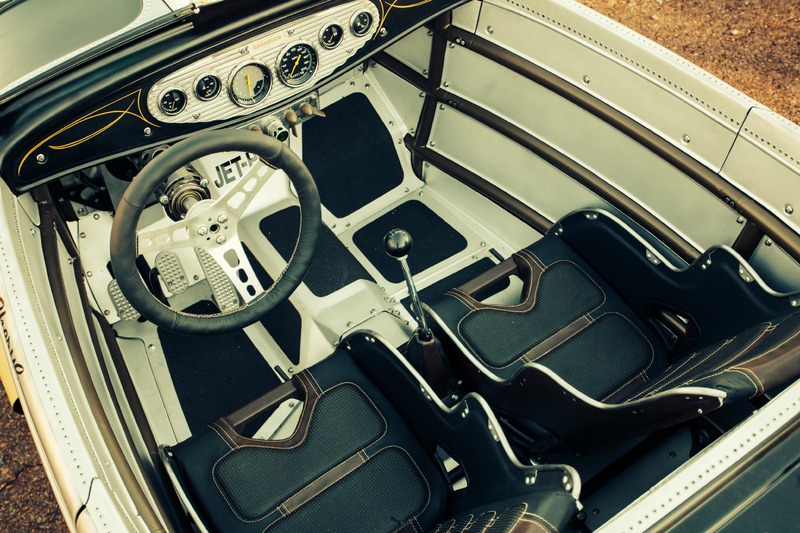 While it was built to be ran on the Bonneville salt flats, Fuller also wanted it to be able to take turns with the best of them. The rear of the car is set up with a custom 4-link suspension with RideTech shocks and up front has custom built A-arms with Ride Tech Coil-overs. Fuller is very well known in the customization world building up quite the reputation for his work on both cars and motorcycles. 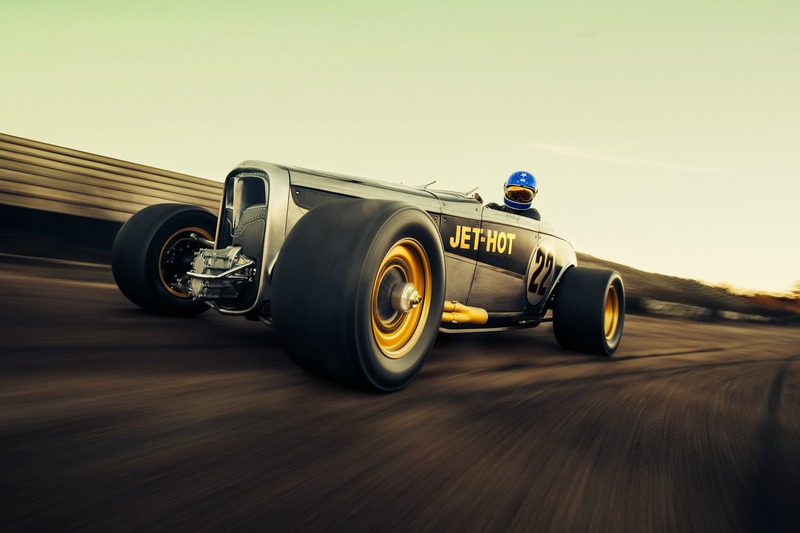 He has worked along side of the greats like Chip Foose and now has become one of the greats himself. What I really like about the work Fuller does, is he really pays attention to the aesthetics of the motor itself. 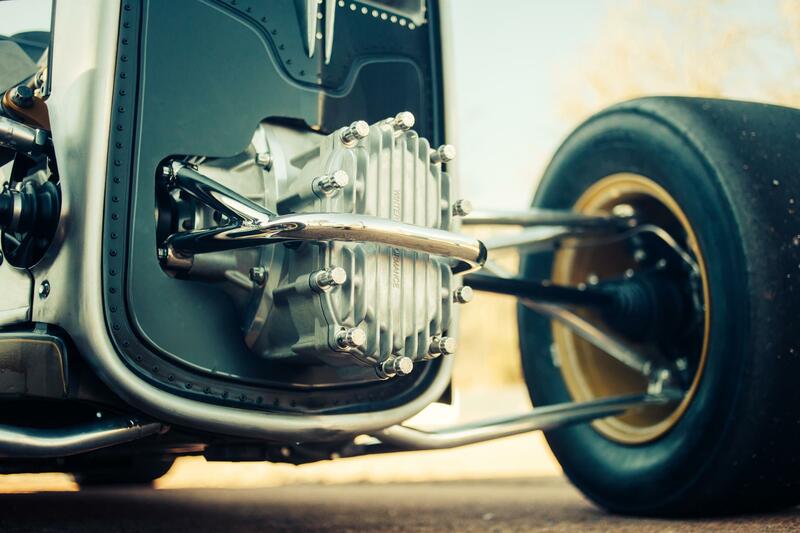 He feels that the motor is part of the visual identity of the vehicle which is what has drawn him to the hot rod style of cars, and of course motorcycles. So take a minute to enjoy the beauty of this masterpiece. I looked for footage of it running at speed but was unsuccessful, hopefully that doesn’t indicate that this car had turned into a trailer queen. Either way, it is a gorgeous car and its good to give credit where it is due.